After the premises of Solomon Beardsley …. Then came Mrs. Joseph Scattergood’s fancy shop. I remember her selling off the stock. Mrs. Joseph Scattergood was born Elizabeth Chadwick in October 1834, the oldest daughter of James, grocer and ironmonger, and Ann (nee Brentnall). In September 1856 Elizabeth married wheelwright Joseph Scattergood. Born in February 1834 he was the second son of Richard, cottager and landlord of the Stanhope Arms in Stanton by Dale, and his first wife Martha (nee Smedley), and came to Ilkeston just prior to his marriage, to trade in the Market Place as a wheelwright and joiner. Her eldest daughter was named Lilly. The first two children of Joseph and Elizabeth Scattergood were Jane Elizabeth and Lavinia Ann, both dying in infancy. Thus Elizabeth Ann (Lilly?) was the elder surviving daughter, with her sister Matilda Jane born three years later in December 1863. Son Frederick Thomas was born in December 1861 but he too died in infancy. In 1855 Joseph had taken over the premises of the late Thomas Bennett and his son Joseph, adjoining the Old Harrow Inn, to continue his business as a wheelwright there. By 1861 he was established at his Bath Street premises – a neighbour of Solomon Beardsley and adjacent to White’s Yard – where the census describes his wife Elizabeth as a smallware dealer while Joseph is a wheelwright. In various later sources he is described as a furniture dealer, smallware and hosiery dealer, surveyor, joiner, builder, cabinet maker and undertaker. In 1864 Joseph, coach builder, painter and decorator, moved from premises he occupied in South Street into Market Street. Obviously Joseph was a man of many skills. And since April 1869, on the resignation of Samuel Pounder, he had served as ‘the Collector, Surveyor, Town Hall-keeper and Inspector of Nuisances’ for the Local Board. These positions required him to collect all rates and rents, the market, statute and other tolls, and issue receipts for all money given to him which was then passed to the Board Treasurer. Barely a few days into his duties as Inspector of Nuisances, Joseph was wandering through the Thursday market at Ilkeston when his nose was drawn to the fish stall of John Harris, a poor man who ran a small business in Carter Gate, Nottingham and who set up an occasional stall at Ilkeston. Joseph decided that the fish on sale were rotten and clearly unfit for human consumption — a conclusion supported by Dr. George Blake Norman who had been called to examine them — although several people were quite prepared to purchase them. At the Petty Sessions, the fishmonger was fined £4 10s and 18s costs. Joseph’s duties as Surveyor and Inspector were printed in the Bye-laws. Under him was a ’Foreman of the Men’ responsible for the workmen employed by the Board and who delivered their time sheets every Friday to the Surveyor. And as Town Hall-keeper he was the security officer, cleaner, ‘health and safety’ superintendent, and odd-job man for that building — charged with its opening and closing as required, cleaning it, caring for its furniture and fittings, making the rooms warm when required, whilst guarding the place from fire and other danger. He had to attend whenever the Hall was open for public meetings and concerts, and preserve order at those events. In 1869 Dr. George Seaton Buchanan became one of two full-time inspectors for the Medical Department of the Privy Council whose job it was to carry out inspections into local outbreaks of disease. And in the following year that same inspector brought into serious question the efficacy of Joseph’s work as Surveyor and Inspector of Nuisances. Buchanan’s report on the Sanitary Condition of Ilkeston caused the doctor to forward a complaint to the Secretary of State for the Home Department. He had discovered that ‘excremental pollution’ was widely diffused in the water of the town, leading to the prevalence of fever. Also cited were ‘ill-kept roads and unclean channels’, overflowing ashpits with filthy refuse, and pig-styes far too close to cottages. The report indicated that Joseph had far too many tasks to fulfil — he could not be expected to survey, inspect and collect without reducing the effectiveness of his work.. In August 1871 a report by England’s chief medical officer John Simon noted that at Ilkeston enteric fever was found to be endemic, air and drinking water was polluted by excrement, ashpits were filthy and drainage imperfect. Perhaps all of Joseph’s ‘multi-tasking’ was some excuse for what happened shortly after. Irregularities were found in Joseph’s account books and questions arose over his competence in collecting rates and fees and in keeping accurate and reliable accounts. In March 1872 Joseph tendered his resignation which was eagerly accepted by the Local Board, though some members wished to dismiss him. Presumably he would have then left his ‘grace and favour’ house in the Market Place. Joseph was succeeded in his duties for the Local Board by William Attenborough, second son of the late Mark Attenborough, proprietor of the Sir John Warren Inn. Because of his misdemeanours — whether caused through carelessness, under-training, overwork, lack of qualifications – Joseph received little sympathy in the pages of the Pioneer, always strongly opposed to the Local Board when it was dominated by Liberal (‘Yellow’) members. And of course, there was always an anonymous letter-writer on hand to ram home a point. On this occasion the obliging correspondent was ‘J.P.S’. Sir – The Board are at last obliged to admit the irregularities of their pet yellow Surveyor, but Sir, how is it that eighteen such clever gentlemen as we have on the Board, though they profess to have met weekly to look over his accounts, should not have detected such irregularities before. “It is well-known that his labour sheets and books have never properly been kept: that he was not able to do it; the Board are therefore themselves as much to blame for the deficiencies as their Surveyor, and ought properly and individually to share the loss and the expenses of audit. The ratepayers cannot help putting the question “how is it that at every monthly meeting the Clerk has reported his examination of the Surveyor’s accounts and that he found them correct; and now, all of a sudden, owing to the query of a new member, they are found to be in a muddle and incorrect?” This surely proves either the incapacity or the inefficiency of the Clerk. It is his duty to see that the accounts of the Surveyor are correct; and if they are not correct he ought to make them so. “Who is to pay the expense of the audit? Certainly not the parish, but the gentlemen who engage servants who are unable to discharge rightly the duties of their station. It is really amusing to see the ignorance of such wise men as the Chairman and Mr. Smith, who admit they did not know on what terms they had engaged the Surveyor. Would they admit such ignorance in their own affairs? The Board may well be in such difficulties when their business is ‘bungled’ in such fashion. By November 1875 Joseph was trading at 72 Bath Street, opposite the Rutland Arms Hotel. Shortly after this he began to erect new workshops in Market Street and in January 1877 he was advertising the opening of these new premises in Market Street and Gladstone Street, offering for sale “hosiery, small wares and drapery, at the lowest prices possible” — he added that he would also supply funerals with “scarfs, bands, gloves and falls” and promised “coffins made to order on the shortest reasonable notice”. In May 1877 Mrs. Elizabeth Boustead, a newsagent but also trading in hosiery and smallwares, moved into Joseph’s old Bath Street shop – as Joseph and family now moved into their new home in Market Street/Gladstone Street. In June 1878 Joseph was expanding his ‘empire’, and looking for builders to help with the erection of six cottages in Gladstone Street. In later life the Scattergood couple continued to live in Market Street and Elizabeth died there, at Spring Villas – at the junction of Market Street and Gladstone Street — in August 1881. Joseph married again and continued to live there into the next century. 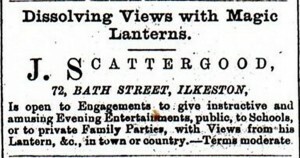 From the early 1870’s Joseph was a ‘patron’ of the magic lantern entertainment and would treat delighted audiences around the town to his shows. That is, until November 1891 when, during a performance to an audience of about 100 at the Stamford Street Chapel, the hydrogen gas flow to his oxy-hydrogen lantern developed a problem which Joseph noticed — though he could recall little of the events which followed. However many members of his audience certainly could. There was a terrific explosion, windows were blown out, holes were made in the floor and Joseph was sent flying over two rows of chairs. Of much more consequence was the death of 15 year-old Hubert Brewer, son of Charles and Ann of Burr Lane, and the serious injuries sustained by several other members of the audience. The entertainment was in aid of the Pleasant Sunday Afternoon Fund. Joseph died in Market Street, in December 1919, aged 85. The two surviving Scattergood daughters, Elizabeth Ann and Matilda Jane, married bothers John Edward and Thomas Herbert Pickworth respectively, both Lincolnshire wheelwrights whose family had moved into Cotmanhay in the 1870‘s. Afterwards the shop was taken by Mrs. S. Beardsley, one side being used for confectionery, the other for under-clothing. The small shop was taken by Mr. George Domleo, of Long Eaton, and opened as a bookseller’s and stationer’s business. Born in 1841 at Sutton Bonington, he was the son of agricultural labourer Thomas and Elizabeth (nee Wheatley) and lived his childhood there. In the 1850’s the family moved to Long Eaton where George worked in the thriving lace trade before he came to Ilkeston. In the mid-1880’s he left the town, once again for Long Eaton, and traded there as a cotton lace manufacturer. And now into White’s Yard.